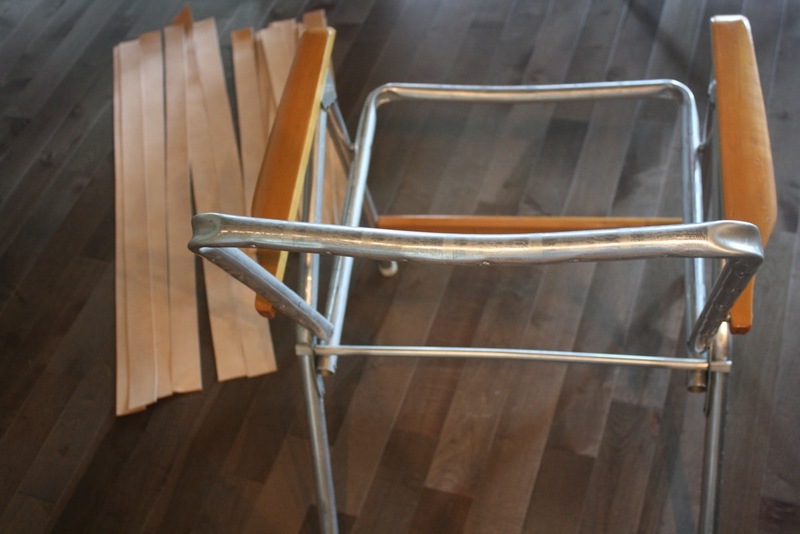 furniture – MY CHICAGO HOUSE. We found a beautiful desk at Father Time Antiques. The desk is from the 1930s and had a green leather top that was in good, but not perfect condition. The desk fit our room perfectly, has a great classic look with history and was on budget at $195. After doing some research, I decided to replace the leather top myself with a new black leather top with gold tooling. I had a great experience doing this, it was easy, and the results speak for themselves. My first step was to vacuum and sand out the interior of the desk and drawers. I waxed and polished the wood and lined the drawers with cork. It initially had a musty smell but that completely dissipated after these steps were complete. I am sure it also helped to have the drawers on the floor for a week airing out. When I removed the leather top, I noticed there was water damage on one area of the desk where the wood felt “soft”. I cut this area out with a utility knife and replaced the veneer with a piece I found on Amazon. I measured the space with a piece of magazine, and cut the veneer with a pair of kitchen scissors. I glued the new piece of veneer with wood glue and placed heavy books on top. Then, I filled the edges with wood putty and sanded it down when dry. I ordered the beautiful new leather top from Dave at DCT Leathers. They are based in Canada and did an amazing job! All I had to do was follow his instructions: brush a layer of wallpaper glue, roll out leather and smooth with cloth. Done! This desk will live in the den, which is painted dark navy / black Railings by Farrow & Ball. I love Chairish, as you may have assumed from my previous post. What I am most excited by is the opportunity to give something “used” a new life, and to find great quality pieces at affordable prices, that are also unique and different! I found this nightstand while searching Chairish and paid $113 for the nighstand + $80 shipping (negotiated down to UPS from white-glove). It is prettier in person than it was in the listing and there are two operational drawers that were not initially highlighted that made me so happy to see. Am now searching for a new lamp with more color to add to this room – potentially an emerald green or a painted floral base. TBC…! Design Within Reach has finally re-released the famous Story Bookcase in a short and tall version here. I purchased ours on Amazon in 2017 before the re-release here. The Amazon version is 79.6″ high, 14 shelves and $285 + $43 shipping. The DWR version is 75.5″ high, 12 shelves and $295 + $21 shipping. If you’ve ever seen this bookcase in a photo and wondered how someone can possibly stack their books so neatly without them falling over, well, this is how. While the bookcase is a bit pricey, I love it because it can hold a ton of books in a super space efficient way and it looks chic. I stack my books from large to small, bottom to top (I wouldn’t recommend any other way), with white bindings or pages facing out. Yes, this means that if the binding is colored, it is facing pages OUT and binding IN such that the entire front of the stack is in shades of white. Of course you can stack any way you’d like. Time consuming exercise to get this right! To most quickly order the books from tallest to shortest I first line them against the wall to gauge height and organize on the floor first, into groups, then transition to the shelves. The Sapiens Bookcase is such a great architectural piece that adds nice interest to any room. If short on floor space, the short stack can be added to the top of a desk or console for equal impact. I made this chair with J and it’s now his favorite reading nook in the house. 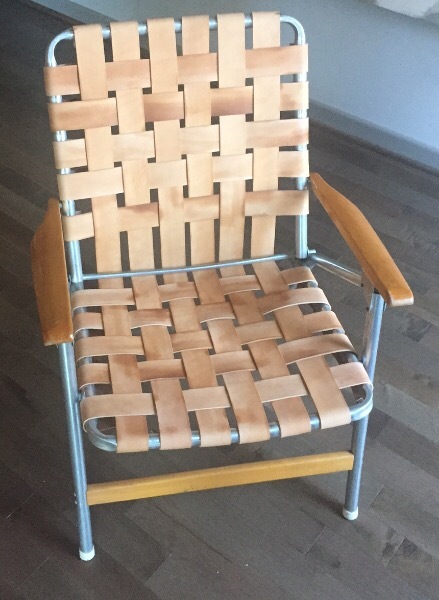 The chair was less than $150 and was made from an old beach chair that I bought on Ebay and some leather strips that I bought online. The directions are limited because the process is simple. 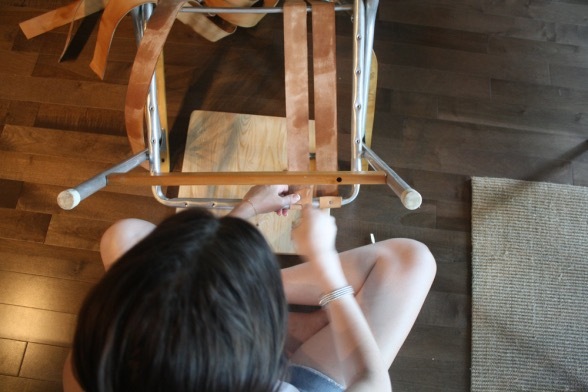 You simply replace the original straps with leather, using the original leather straps as a guide for cutting the leather to size and for attaching to the frame (poke hole, simple screw). It’s easy and it’s chic and it patinas over time! 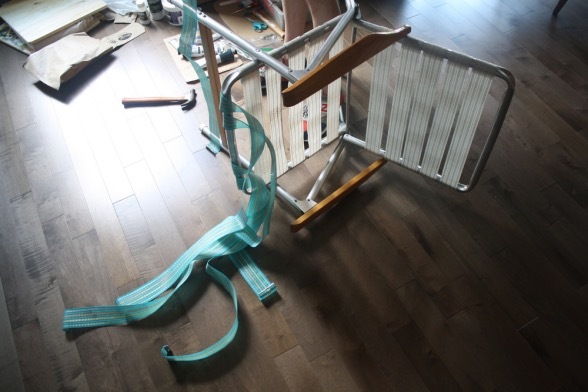 (See photo at top taken months after the chair was assembled).